My third great grandfather Jacob Bahle was a private in Company H, 6th Pennsylvania Heavy Artillery during the Civil War. Jacob was a garrison soldier, protecting the railroads around Washington, D.C. He saw no combat. Interestingly, when I first moved to Arlington, I lived just a few miles from where he spent 1864 and 1865. Like many soldiers, he filed for a pension following the war. Each pensioner had a pension index card with a brief service history, the date the pension was issued, and the law under which it was awarded. 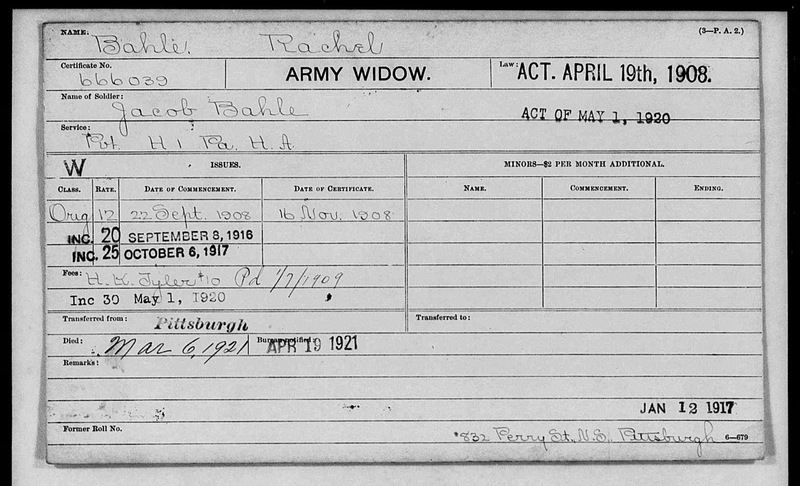 These pension index cards indicate the date he applied for a pension and, following his death, the date that pension was assumed by his wife Rachel. A trip the National Archives in the next few weeks should provide his complete pension record, with documents detailing his service, possible disability and perhaps additional family information. I can’t wait! 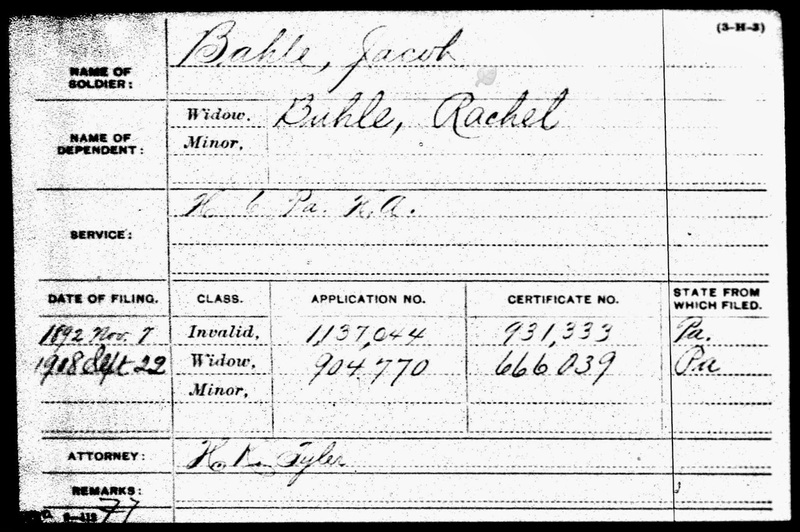 Top: “United States General Index to Pension Files, 1861-1934,” index and images, FamilySearch (https://familysearch.org/pal:/MM9.1.1/KDPL-TXW : accessed 22 Oct 2013), Jacob Bahle, 1892. Center: United States Veterans Administration Pension Payment Cards, 1907-1933,” index and images, FamilySearch (https://familysearch.org/pal:/MM9.1.1/K6WL-Q52 : accessed 22 Oct 2013), Jacob Bahle, 1907-1933. 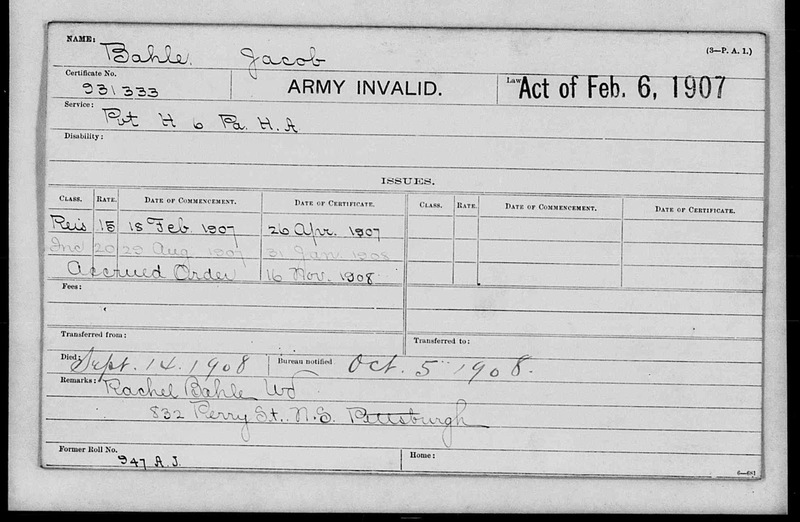 Bottom: “United States Veterans Administration Pension Payment Cards, 1907-1933,” index and images, FamilySearch (https://familysearch.org/pal:/MM9.1.1/K6WL-Q5R : accessed 22 Oct 2013), Jacob Bahle, 1907-1933.